Arco-Íris (Leiria, Portugal) on 28 March 2007 in Lifestyle & Culture and Portfolio. Alfons Maria Mucha (24 de julho de 1860, Ivancice - 14 de julho de 1939, Praga) foi um ilustrador e designer gráfico tcheco e um dos principais expoentes do movimento Art Nouveau. Lovely vitral, muy hermoso. Great photo, nicely composed and captured! Bem apanhada a foto. Até porque este tipo de fotos, às vezes é complicado. a wonderful piece of art, finely captured badala. good job. Very well done I know how difficult it is to capture a stain glass window. @Colour blind: Thank you . @Angry Buddha: Thank you Sean. Great shot. Love stained glass windows. I love this shot. Very beautiful colours! that is very beautiful - I like the angle! SO beautiful! I love stained glass. This photo makes me feel that church is a place worth going to. 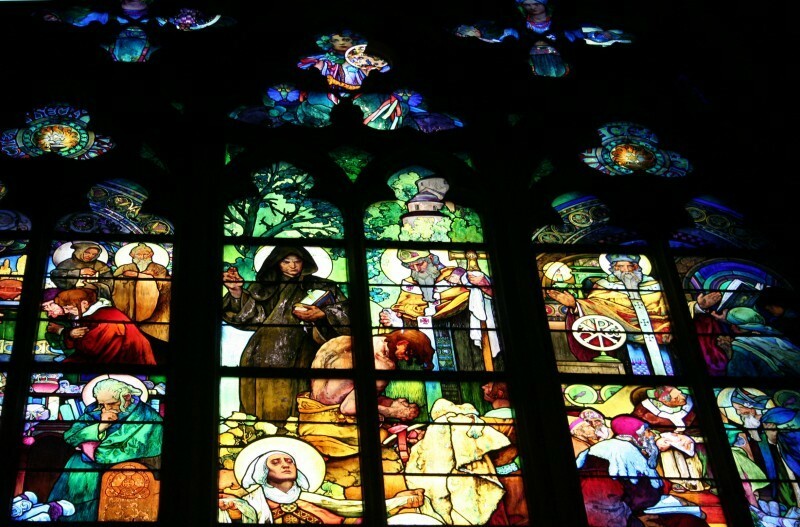 Bono of U2 says that stain glass windows were the first movies!! @Gordon Ashbridge: Thanks for the visit. yum, what beautiful colours and I love the way that the detail of the wall disappears at the top yet the coloured glass is still as detailed and rich! what a beautiful art!! details and colors, Well done! So beautiful. The colors are amazing. I LOVE, LOVE, LOVE, LOVE THIS PHOTOGRAPH! how you presented it adn the colors are really, really, really excellent ! Belas cores e um enquadramento quase perfeito.